PHILADELPHIA, Nov. 6, 2018 /PRNewswire/ -- The Tolan Group, a leading executive search firm and proponent of Life Prep University (Life Prep U) is giving back to the community with a donation of $10,000 to Carson Valley Children's Aid (CVCA). For more than 100 years, CVCA has served the needs of at risk children from Philadelphia and surrounding areas. This gift will contribute to empowering youth in achieving their goals for a successful life by transforming Life Prep U space at CVCA's Allegheny West Center into technologically advanced hub where students apply for jobs, study, create art, and participate in life skill workshops like how to build a household budget and how to do laundry. The Tolan Group, based out of St. Augustine, FL, is recognized for their industry experience and performance driven placement services in healthcare and social enterprise. Tim Tolan, CEO of The Tolan Group, said "It's important to understand that no single organization alone can provide the resources that are needed at Carson Valley, I think it takes a village to make a difference. Our firm is based in Florida, but we felt compelled to help Carson Valley and make a small difference in the important work that's being done here. I'd like to call on local businesses in this area to step up, contact and visit Carson Valley … to understand their challenges as more than just a valuable and deserving charity, but understand that it's an important investment for the community. You have the power to make an impact, to help these children and their families, and I encourage you to give back by donating your resources to help them financially because your support will change their lives in ways you just can't imagine. They need your help, and it will make a huge difference; it matters." 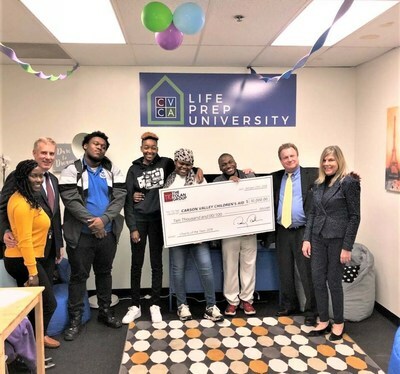 All Life Prep U participants are currently enrolled in high school, community college or vocational school and are actively looking for employment. "There are plans to take the program mobile because that's the way of the future. For these students to have access to these skill building supports outside of this space will continue to build the foundation on which the program was started" said CVCA Director of Community Based Programs, Mark Butler. During the event, students participated in the celebration by sharing their perspectives on having access to a space like Life Prep University, and how the program has impacted their pathways to success. Tolan Group Vice President and Practice Partner, Mason Harris addressed the audience by asking "How many believe that luck impacts your life? Luck does not define us, but it's what we do with that luck. Just as money doesn't solve problems, it's what you do with that money that matters." "It was wonderful to have The Tolan Group come up, and acknowledge our children, because quite often our children are forgotten; and somebody remembered them" said Raheemah Shamsid-Deen Hampton, Southeast Regional Director, Commonwealth of Pennsylvania's Office of Children, Youth and Families. "It's because of [our children] that I get up every day and do what it is that I do." Carson Valley Children's Aid is dedicated to delivering services to children, youth and families that ensure their safety, build on their strengths, honor their differences and empower them to achieve their goals for success in life. For more information about Carson Valley Children's Aid please visit www.cvca-pa.org.